Sports Doping Watchdog Says Russia 'Non-Compliant' : The Torch The World Anti-Doping Agency says Russia's official sports drug-testing lab doesn't meet guidelines, placing in doubt the country's participation in the Winter Olympics. 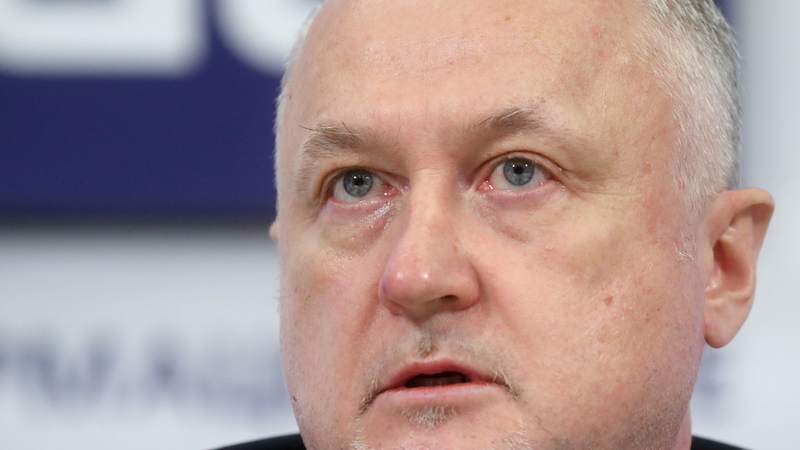 Yuri Ganus, director general of the Russian Antidoping Agency, at a news conference in Moscow. The World Anti-Doping Agency says that Russia's official sports drug-testing lab, which was suspended in 2015 following evidence of state-sponsored doping, remains "non-compliant." WADA Foundation Board approves the recommendation by the Independent Compliance Review Committee that RUSADA remain non-compliant. The finding throws into doubt whether Russian athletes will be allowed to compete in the 2018 Winter Olympics in Pyeongchang, South Korea, in February. That decision was set to be made at the next board meeting of the International Olympic Committee beginning Dec. 5. Following the announcement at the meeting in Seoul of WADA's independent compliance review committee, Russia's Sports Minister Pavel Kolobkov said the criteria it had used to determine whether RUSADA should be reinstated was of a "political character." "I got the impression that the decision was made in advance," Kolobkov told Tass news agency. "We believe that the state has fulfilled all of its obligations." At a news conference in Moscow, RUSADA's Director General Yuri Ganus called the decision "lamentable." "Let me make it clear that for us, that was not a surprise," he said. Russian President Vladimir Putin has said that international sports organizations are subject to "relationships and dependencies" with a "controlling stake [in] the United States." A week ago, the International Olympic Committee found another four Russian cross-country skiers guilty of doping at the 2014 Sochi Olympics, bringing the total to six, according to Sports Illustrated. As we reported in 2015, an investigation by WADA found evidence that the Russian anti-doping agency, RUSADA, enabled rather than caught athletes who were using banned substances. As NPR's Bill Chappell explained: "WADA says the lab had different fee systems for handling tests that showed proof of doping, with one price for handling a positive test they had been told to look out for — and a second, higher price for covering up test results they hadn't been warned about." And, just last week, NPR's Laurel Wamsley reported that WADA had obtained what was described as an "enormous backup file" from RUSADA covering all testing data from January 2012 to August 2015 — a period that covers the 2014 Sochi Olympics, where Russia was dominant. RUSADA had been unwilling to hand over the data earlier, and according to The New York Times, it was obtained by WADA via a whistleblower.